A spate of recent updates caused problems in Outlook and the short-term fix is to uninstall the update; however, updates can’t be uninstalled from the Click-To-Run installations of Office, and almost all users have the Click-To-Run installation. Instead, you will need to revert to an earlier version. First, you need to disable Office updates. If you don’t disable updates, the problem update will reinstall itself. You can disable updates from the File menu in any Office application. In Outlook (this is an Outlook help site after all), go to File, Office Account, Update Options and click on Disable Updates. Next, create an appointment in your calendar for 30 days from now to remind yourself to check for updates. In many cases, the “bad” file will be removed or replaced with a corrected update, and you can allow Office to install updates without reinstalling "trouble" after a few weeks have passed. Now you’re ready to roll back the click-to-run installation. If you are using Outlook 2016, copy the following line, then right click in the command prompt window to paste it. Replace xxxx.yyyy with the build number you want to revert to. You can look up build numbers at Version numbers of update branches for Office 365 clients. 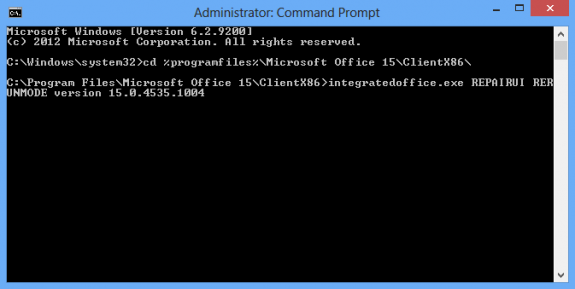 You’ll revert to a previous version of Office by running officec2rclient using a command line in this format, where 15.0.xxxx.xxxx is the previous version. Choose Online Repair. Once repair is complete you can check your version to verify it updated properly. Note: you'll probably be asked to log in again and verify your license. A million thumbs up! This triggered an update for my CTR version that was stuck at the RTM version. Uninstalling the latest Update works perfect by your descriprion. I am getting the error: The latest version of Office approved by your system admin is installed on your computer. But this is my computer already so I am the system admin. I was trying to use an update that was on the "Current" Channel, and my computer was on the "Deferred" channel. I did not realize that these channels were even a thing. So after applying an update to switch from the Deferred Channel to the Current Channel. I can choose the update that I want to use. Microsoft Office, does not throw an error screen to say "HEY YOUR UPDATE DOESNT EXIST ON THIS CHANNEL" Nope. They just say that your as up to date as your admin wants you to be. The channel you are on is in the File, Office Account (or Account in the other office apps) -its listed right under Microsoft Office [suite name]. Your Up to date! The latest version of office approved by your system admin is installed on your computer. Is this a company computer? if so, you are stuck with the version/updates they have tested. Sorry. i have the same issue "the latest version of office approved by your system admin is installed on your computer". I started with build 7466.2038. I was able to downgrade to builds 7369.2055, 7369.2054, 7369.2038 using the method above. But when I tried to downgrade to build 6965.2092, I got the "latest version is installed" message. Using office365 university on windows 10. I did this and when I ran the on line repair tool, it came up with an error after deleting the existing version. I had to get Microsoft to re-install my office.They used the same version as was on the machone when it stopped working, and I still get asked for passwrods every few seconds. I have now had to stop using the product as it no longer is usable. I was glad to find your article having huge problems with Access and Access Runtime 2013: The "Access" has a higher version than the runtime as it is being updated by the click-and-run, not so the Runtime version. Unfortunately I can not compile an access database accdb to an access database accde and use the runtime to start it. It's not only my problem, it's a real problem for many developers. Unfortunately the method you described did not work for me. I did as advised, but my Office 2013 Plus seemed to be installed back to the latest update available (again, passing the SP1 and runtime version numbers). No, I don't but maybe someone else does. I'll check with my contacts and see if there is a solution. I was a bit too quick, I deleted my account and the problem disappeared. However the other forums I have seen, this will probably only be a temporary relief from the problem. I'm not using any network utilities to see what specifically is sent/received. 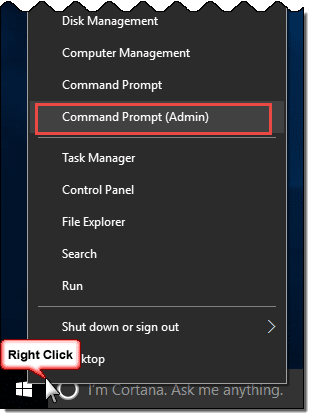 How do I turn on logging in Outlook? Hopefully, it will fix it - its supposed to. The update made some changes to imap and outlook needs to resync the data file. A new account should sync it once, using the new changes. Logging: File, Options, Advanced - scroll to the bottom - its the second check box from the bottom. Restart outlook and let it run for a bit, then go in and disable it. Log files are in the temp directory at C:\Users\username\AppData\Local\Temp\outlook logging. There may be two other folders created in the temp folder, but imap logs will be in outlook logging folder. The office suite is Microsoft Office Home and Business 2013. What do you mean by removing the datafile? Do you mean deleting the account in outlook and reconfiguring it? Or can I just delete a specific file to let Outlook resync? The problem is that outlook 2013 isn't showing that it is using any data, there is no way to see in the program, that it's devouring bandwidth, it just happens in the background. 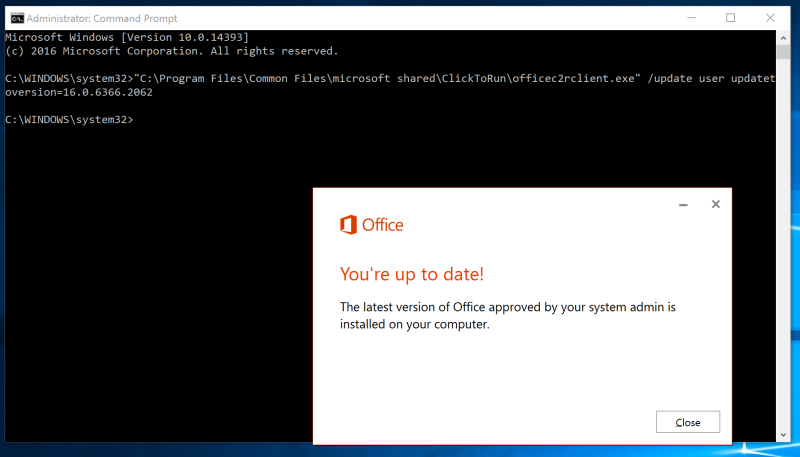 Regarding the fixit, I have already tried reinstalling office anew in the hope that it would fix my general problem with integratedoffice, but with no success. I did try another version number in the cmd, but also no luck. Same error. All the while automatic updates were turned off. Don't remove the account, just the specific data file. It's in %localappdata%\microsoft\outlook - type or paste that into the address bar of windows explorer and press Enter to open the folder. Delete the ost file for your imap account and restart outlook. Warning: before closing Outlook to do this, check the calendar, contacts, tasks, notes folders labeled "this computer only" for contents. If you have content in those folders, move them to a pst file to back them up before deleting the pst file. Are you using any networking utilities to see what is being sent/received? Or turn on logging in Outlook.